Uranium was discovered in 1789 by M.H. Klaproth in Berlin, Germany. Although uranium is the longest known member of the actinide group of metals, it attracted scant attention until the discovery of uranium fission in 1939. It is now of vital importance as a nuclear fuel. 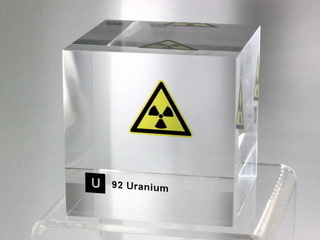 Uranium occurs naturally as two main isotopes, 238U (99.3%) and 235U (0.7%), along with a trace of a third isotope, 233U. Separation of the isotopes is achieved by conversion to the hexafluorides. The 235U isotope is the more important as this reacts with a neutron by fission to form lighter nuclei, the reaction being accompanied by the release of a considerable amount of energy and more neutrons which, in turn, fission more 235U and permits the build up of a chain reaction. The energy released as a result of this nuclear process is the order of a million times greater than that resulting from burning fossil fuel and it is for this reason that there is substantial interest in nuclear fission. 238U is also important in a nuclear reactor as it can absorb neutrons itself to produce heavier elements, the most important of which is plutonium, another nuclear fuel. Under the correct conditions, more plutonium can be produced from 238U than the amount of 235U consumed, and such an arrangement is found in a "breeder" type of nuclear reactor.